landscape | House by the water. Our barbecue collection is becoming a bit embarrassing. Lest we be caught short without a barbecue, our current count is 4, spread over 3 locations. But that is not enough for The Nice Wolf (a.k.a. husband). Australians love to barbecue, but so do Canadians, Brazilians and South Koreans and they all do it in different ways. Aussie 1/2 gallon drum, complete with flies. The Nice Wolf loves to entertain and if he invites you for dinner, the chances are you will be fed either BBQ or pizza. And when the husband is cooking, which wife in her right mind would deny him the “necessary” tools? So the outdoor kitchen at House By The Water shall be requiring a standard Australian/Canadian style barbecue, a Brazilian churrasqueira and a pizza oven. 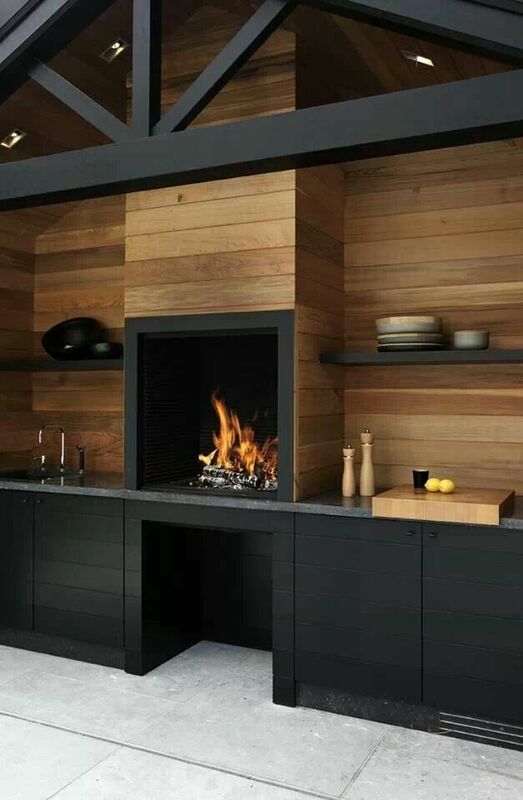 This is probably the closest example of how I imagine our BBQ area to look. 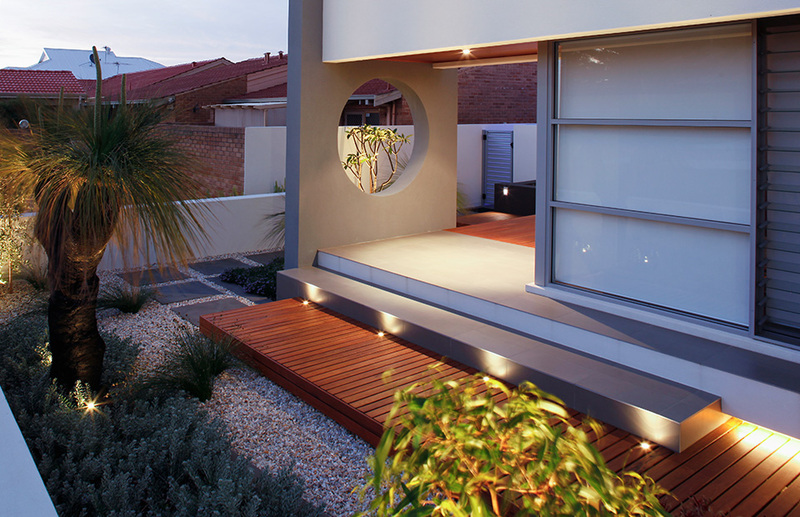 Amazing Melbourne back yard by: COS Design. Space hungry but beautiful. Source: Menossi Fotografo. Building approval required for this rather OTT outdoor kitchen. Never-the-less, it’s classy. Photo source: unknown. Subtle BBQ bench by Secret Gardens. Keeping the outdoor style consistent. Modern Australian with a touch of Italian and Brazilian! 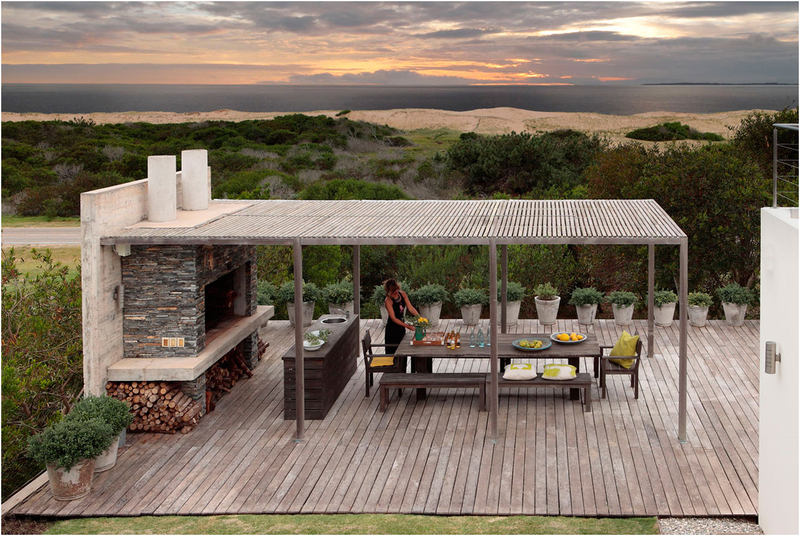 Have you got a fancy outdoor kitchen plan? What are your back yard cooking essentials? Could you start your own barbecue shop? HAPPY FATHER’S DAY to my Dad whose favourite BBQ method is a snag in a pan on a campfire in the paddocks, and to the Nice Wolf, who likes that too! I’m not the worst gardener in the world, but I reckon some of those beautiful vertical gardens wooing me on television screens and magazine pages, could be money down the drain. Some are gorgeous works of art when they are first installed, but I wonder how they look one year later. Creamy coloured old brick wall. Site for future vertical garden. The dining room shares a partial view of the same brick wall. I’m not sure how the neighbours intend to replace the fence they took down, but at least, the existing section needs beautifying. 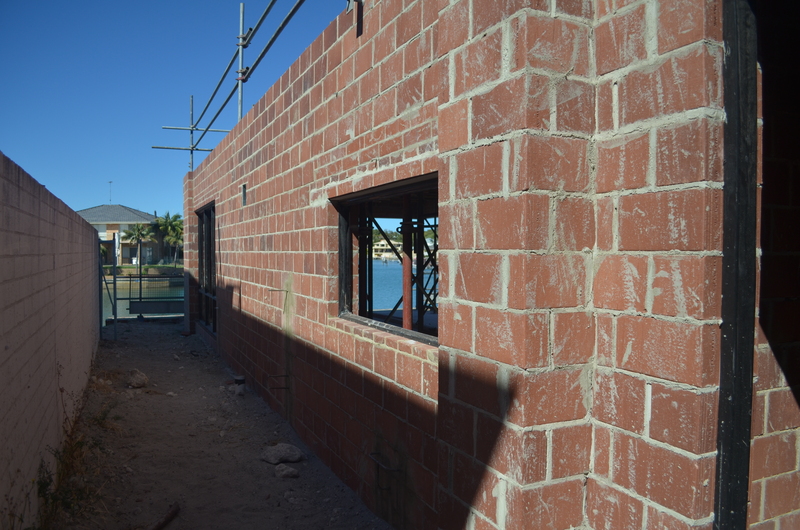 The width between the house and the brick fence is 1.6 metres at the narrowest point. 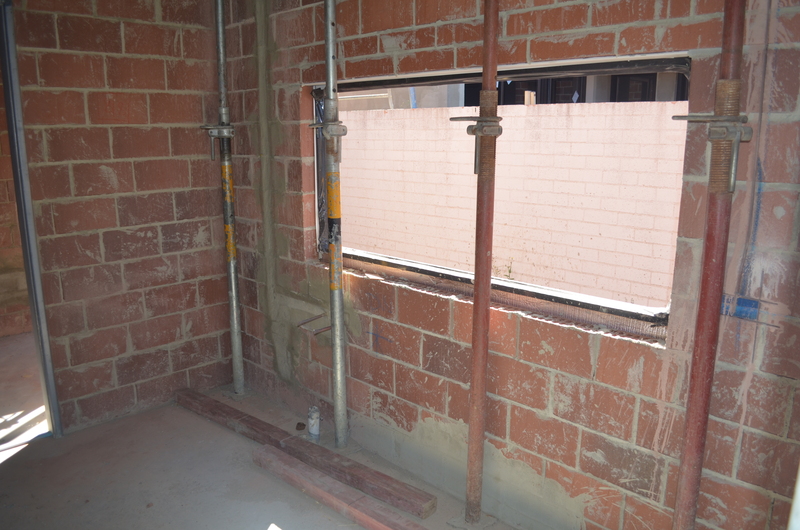 Shared utility space for garage access, washing line and bin storage. Strong chance of being a wind tunnel. Exposure to sun: only a few hours per day. Plant climbers into the ground. Help them with some simple wires. Photo sources: 1. Flickr. 2. Lucy Williams Interior Design. 3. Herbidacious. Pot plants and use shelves or some kind of structure to layer them up the wall. Photo sources: 1. Revista Natureza. 2. One Kings Lane. 3. Flickr. 4. Wanilla Rose (unverified). Use a simple pocket system for vertical gardens, with or without an irrigation kit. Photo sources: 1. Wemmy. 2. HGTV. 3. Plants On Walls via Buzzfeed. Use a complex vertical garden structure with built in watering system including a pump. Photo sources: 1. Better Homes and Gardens. 2. Garden design. 3. Watergarden Warehouse. I’m going to save options one and two for the front yard, to hide the rear walls of the neighbours’ garages. The front yard faces North and there will be room to condition the soil, so espaliered fruit and climbing plants should do well there. Options four and five scare me. In our challenging conditions, I’m worried we’d end up with an expensive, dead mess. For my scullery view, I’m favouring the plants in pots option. We’ll render and paint the brick fence almost black. We’ll add some structure to give the plants height so we can see them. I’ll recruit a large, hardy pot of rosemary or something equally tough to act as a wind break, or if necessary construct a screen. Worst case scenario, move struggling plants to a happier location. Yep, I could gaze at this while I scrub some dishes. Source: Revisita Natureza via Blog da Ayda. 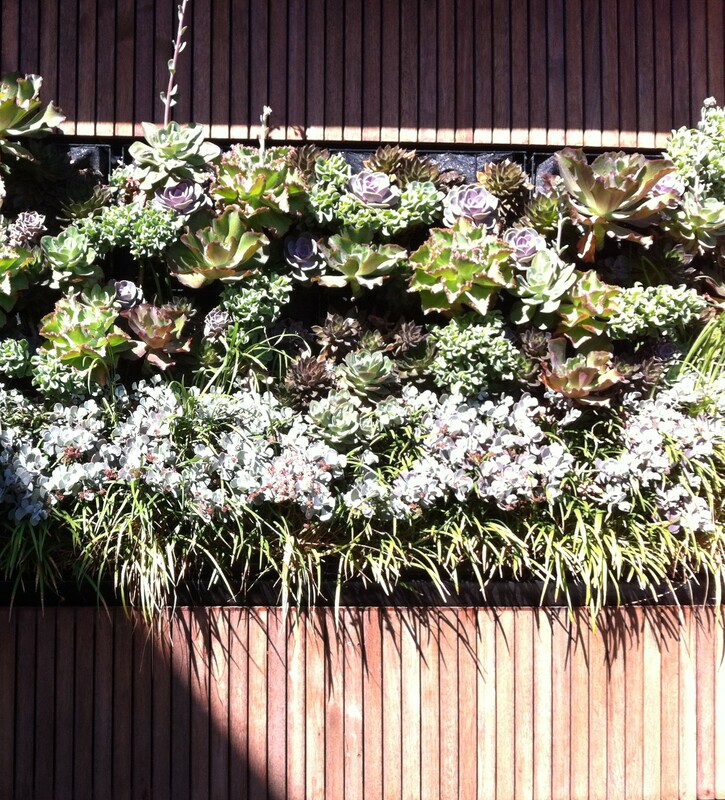 For more vertical garden ideas of all descriptions, take a look in my Pinterest file. Little discoveries from my W.A. visit. 1. I’m so glad I checked out the “Cocoflip” pendant replicas. At $300 (versus $1500 for the real thing) – I had to consider them. They looked great from 2 metres away, but then as I got close I noticed that there was no join between the “ash” top and the “aluminium” bottom. So I reached out to see how it was done and realised that the whole thing was painted tin. If I’d been fooled online and had the replicas delivered I would have been so disappointed. 2. A sad moment at Myaree Ceramics…. the oil-blue tiles that I had coveted to replace our discontinued splash back tile, have also been discontinued. No time for crying. There were a number of good options that were close to my original grey subway tile selection. I’m going to have it laid vertically for a modern touch. Next, I needed to reselect floor tiles for the laundry and powder room. The laundry was easy. I’m keeping it simple. A matt grey tile. The powder room, however, is a little room where it may not cost much to experiment with something a bit “out there”. 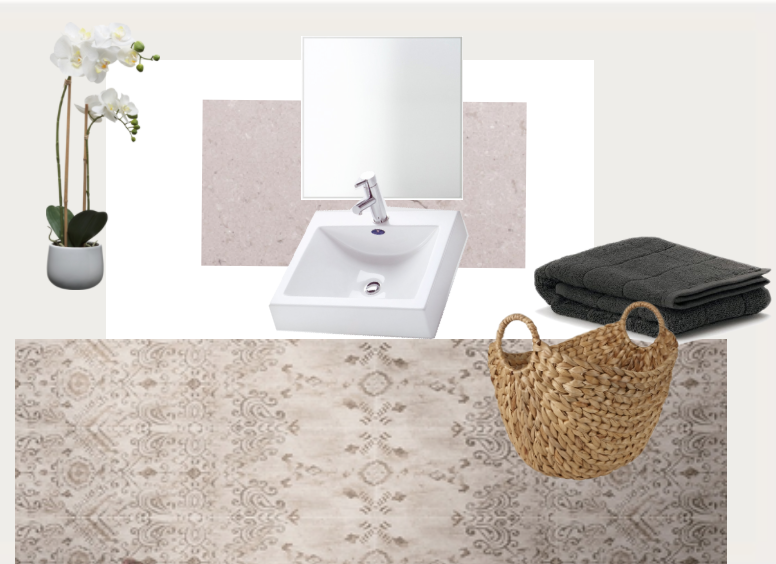 This floor tile is a bit unusual so I made a mood board to help the Nice Wolf visualise how it might look. Here the Caesarstone bench top in clamshell and the floor tile seem to clash but in reality they looked good together. The tiles actually come in 4 different prints (of which we’d use 3) so the tiler will have to puzzle it together. Hmmmm? That could be unpopular. I’m waiting for the costs of laying this tile to be confirmed before I commit. 3. Next stop, a meeting with the owner of “Well Built Landscape Construction” (WBLC) to discuss our front yard plans. I give Nick 10 out of 10 for keeping his overheads low, with our meeting taking place in McDonalds! WBLC gave me the best quote for a cobblestone driveway and have produced some stylish home landscaping. We discussed the driveway and our front fence and gate. I begged him to help me decide whether to go with vertical wood or steel infills and render for the front fence. He would have humoured me with either option, but my sensibilities and his have pushed me towards steel infills. WBLC will provide a quote to kick-start our front yard, leaving the garden preparation for us to do at our leisure. Landscape by Well Built Landscape Construction. 4. At Nick’s suggestion, I went to Water Garden Warehouse to study steel infills for our front fence. They supply my favourite steel infill pattern – the “wattle”. Available from Water Garden Warehouse. I photographed steel art featuring this pattern a year ago at Home Base because I loved it. It’s still my favourite. 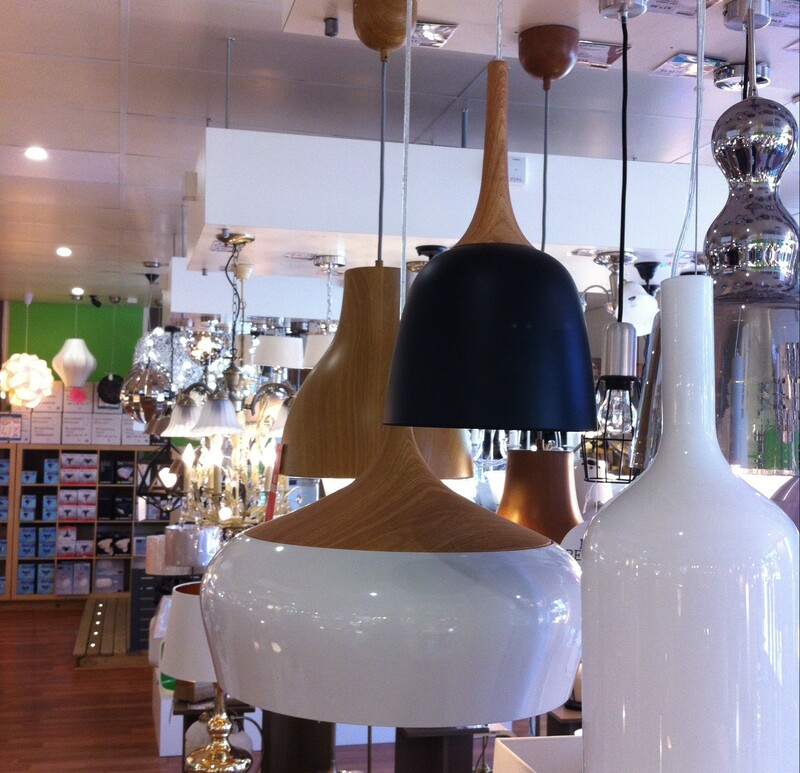 We need to choose a finish. 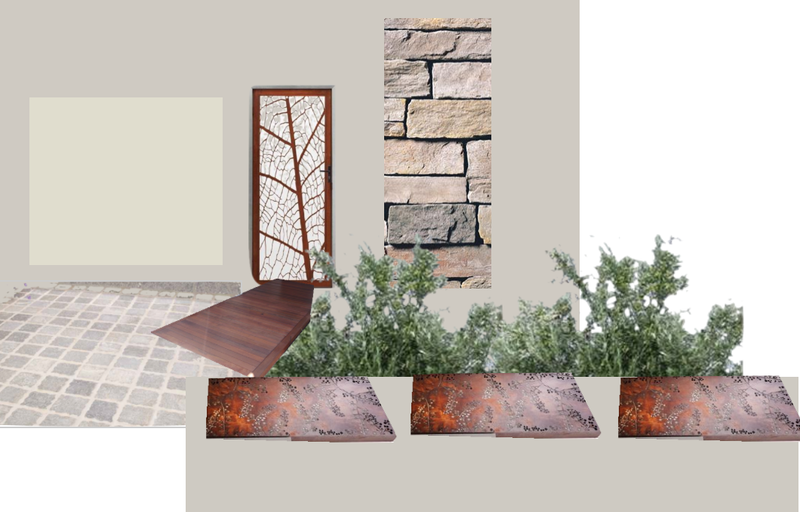 Powder coated is smart (no rust stains dripping down the rendered wall), but the rusty steel and Corten options have a more organic look. Front yard mood board. Work in progress – but you get the idea. 5. And just because it’s right next door to Water Garden Warehouse, I had a browse in Eco Outdoor. Our cobblestones will come from here and I always love their outdoor furniture, though it’s usually over-priced. Currently they have a sale on so their outdoor sofas are closer to the realms of possibility. It’s a good place for alfresco inspiration. They have some tempting heavy linens for making cushions and a great vertical garden. The wooden frame hides typically ugly vertical garden infrastructure. 6. I popped into to say hi to my “Construction Liaison” at Webb and Brown-Neaves’ office. It’s always nice to put a face to a name. Emma took the time to explain to me a proposed change to the width of our “gutter fascia” that despite my best attempts to understand, by studying the drawings, I still could not fathom. I have been assured that the change is purely cosmetic. So that’s it. All else for the remainder of our house construction must be done remotely. 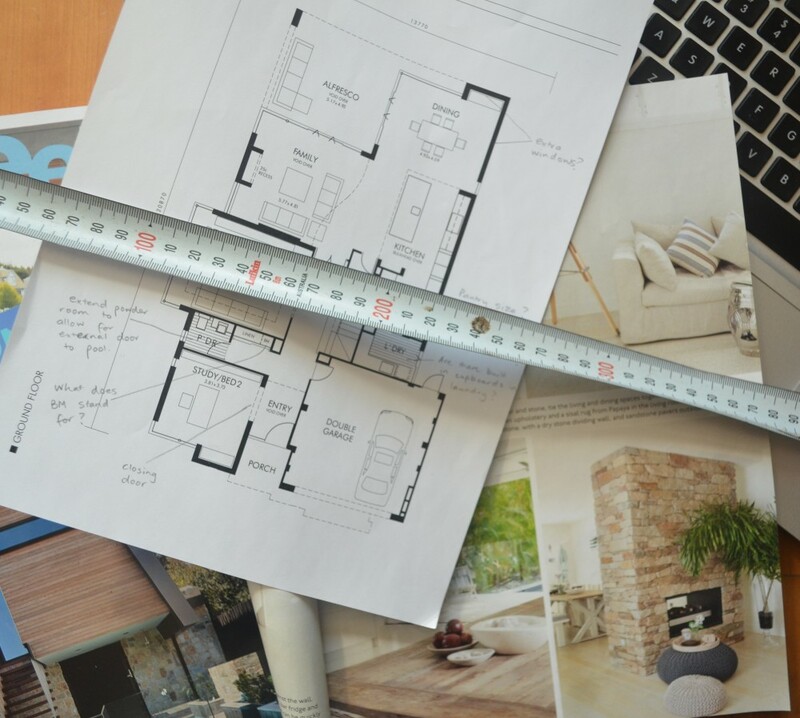 The next time I visit Western Australia will be for the “practical completion inspection”. But you know, I’ll be hovering around in the mean time, one way or another! First dip into the pool. Design by Tim Davies Landscaping. This week work on our pool began. I’m told that if we built the house first, deeper footings would be necessary to accommodate the pool so close to the house. The down side is that the builders will have to work around the pool, and for that to happen safely, the pool will be covered by scaffolding. Tim Davies Landscaping (TDL) have designed the pool and its surrounds and have subcontracted Future Pools to actually construct it. $45 650 (not including fencing or paving, includes TDL’s fee). We went backwards and forwards with the concrete versus fibreglass decision. I’m not commenting on this debate because my findings on the subject were inconclusive. However, choosing a fibreglass pool of this size could have saved us $14000. In the end, we went with our “gut feeling”, influenced in part by the historical superiority of concrete pools and the wisdom of my Uncle, who’s occupation is servicing pools. 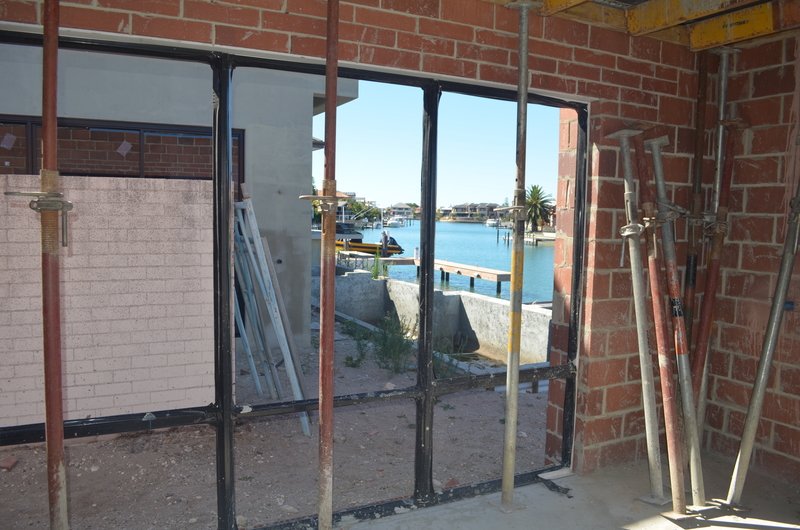 Gates and fencing – a mix of glass, aluminium “slats” and modutech screen. (The latter may be replaced at a later date by a “pool/sauna house”. Screen for the pool equipment. Pool blanket and somewhere to keep it when not in use. I shall be leaving the finer details of that to he-who-wants-the-pool, however any pool dwellers out there with advice, you know I’m all ears… And while I’m at it, my favourite-neighbour-ever is moving to Perth (yippee!) and is in the market for a new pool. W.A. 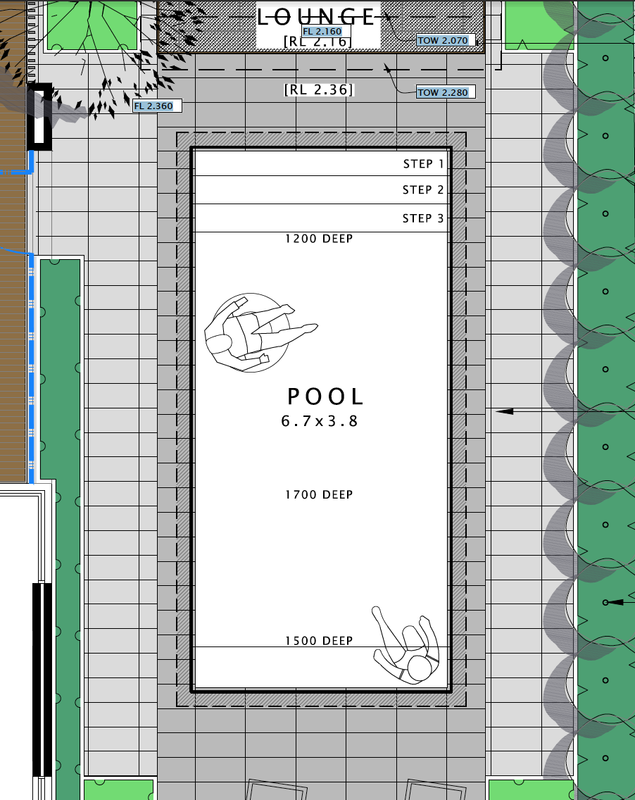 readers with recommendations for pool installers, please do leave a comment. 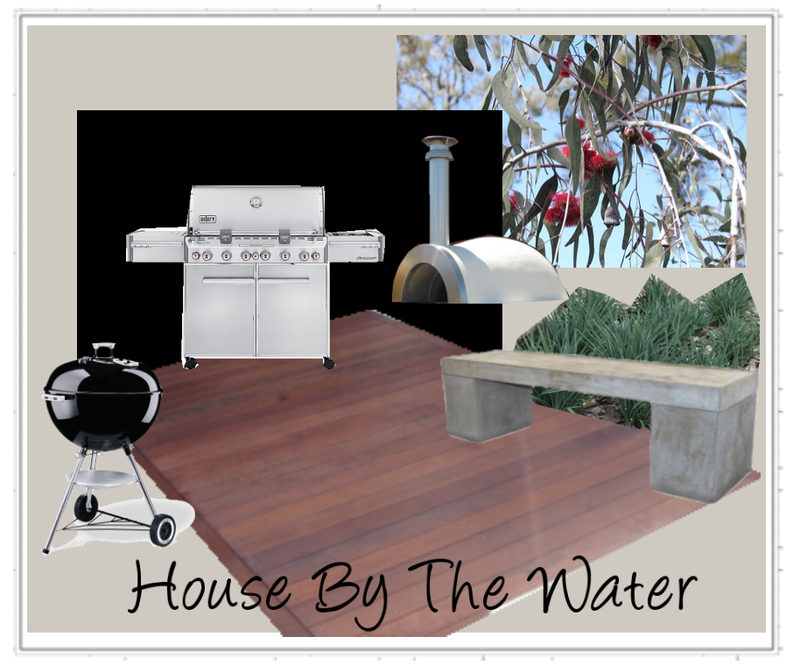 And just because I love to daydream about House By The Water, I made a pool mood board. Tiles: Marazzi “block” for outdoors in Grey and Silver. Finish: Duraquartz in “sky blue” (TBC). Trees: Pleached Lilly Pilly trees (or pears/olives/evergreen ash?) and a feature Frangipani. Outdoor lounge: Lujo sun lounge. House render: Dulux Grey Pebble (shown as background colour). It’s looking good, if I may say so myself!